Clarity is a data capture solution primarily for activity analysis which can record the date, time and duration of specific activities through the use of barcodes. Designed to be flexible, the off-the-shelf version can be used for almost any data capture application where real-time analysis is not required. In depth analysis and reporting of the activities staff are undertaking: for how long and when. Unparalleled flexibility allowing its technology to be applied to almost any data capture task you may have. A web interface allowing instant access to its data from anywhere your network allows. Legendary ease-of-use for both users and system administrators. A powerful reporting engine meaning your data can be presented in any way you see fit. 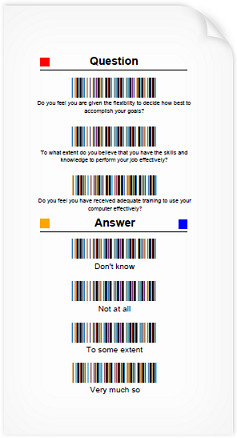 A system administrator uses the system to create colour coded barcodes which each represent a task, activity or other information such as questions and answers to a questionnaire. These are scanned with a supplied barcode reader. This process repeats throughout the day/scanning period, at the end of which the scanner is connected to a PC via USB and the captured data is streamed to Clarity and analysed. Staff training can literally be accomplished in minutes, and the daily time overhead of the system is virtually nil. What can I do with the data I gather? 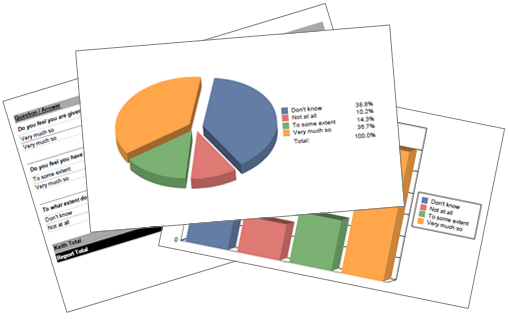 Using Clarity's powerful reporting engine, the collected data can be presented in a myriad different ways. From efficient tabular reports to beautiful yet functional 3D charts, Clarity can always present data in a way that is clear. And if you're the technical type, you can even export the data to Microsoft Excel, to manipulate and report on the data in any way you see fit. Free Bespoke Application QuoteWe're experts at bespoke software. Get your free quote.